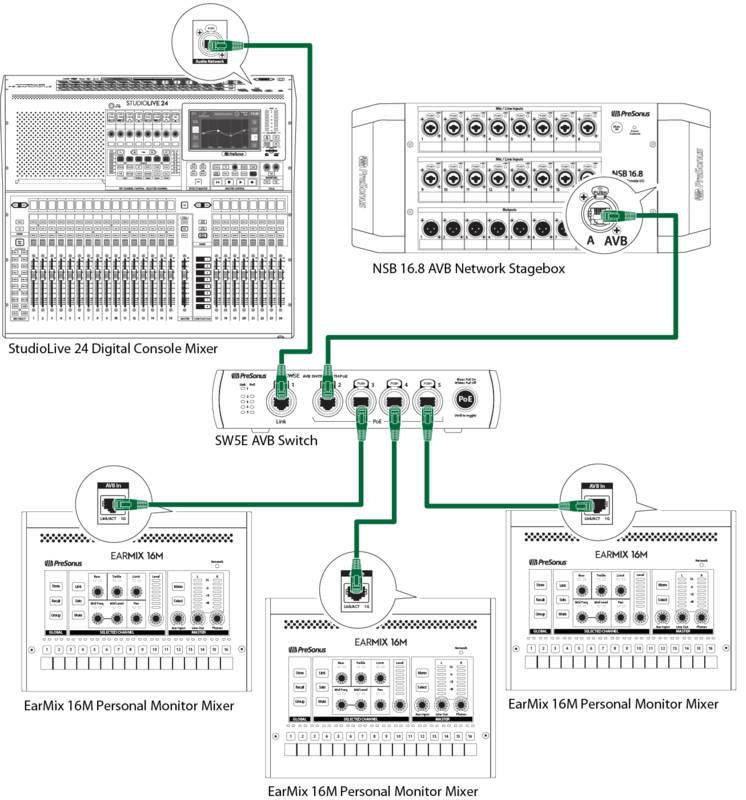 AVB provides several different methods of Network topology. 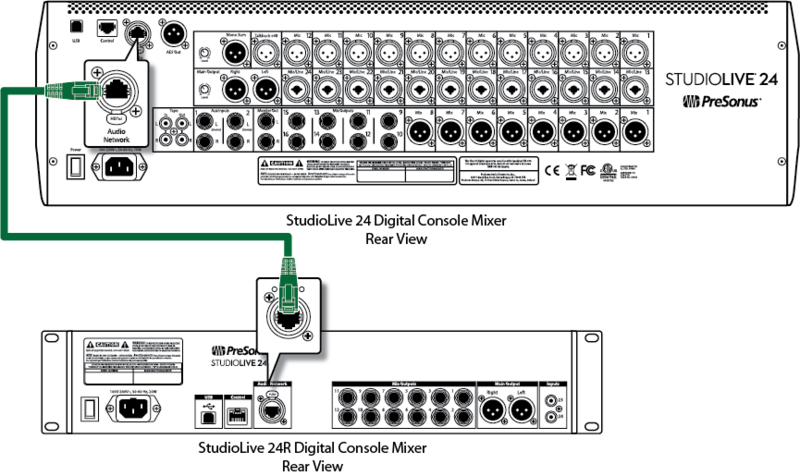 This section will outline the three different methods of connecting your PreSonus AVB network. It is important to note that these three different topologies can be used individually or combined depending on your particular application. 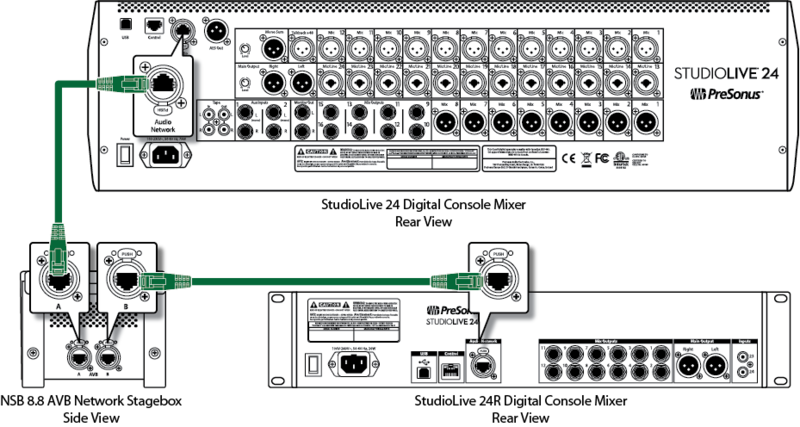 When deciding which method or methods will best suit your needs, take into consideration your channel count, system latency, the number of locations, as well as future needs to expand your system. A point-to-point or P2P network is the simplest to design. While not technically a network in and of itself, a Point-to-Point configuration relies on networking protocols in order for two devices to transmit data to one another. In both of these examples, an Ethernet cable is run from one device to the other and the routing is handled efficiently from the console mixer’s touchscreen. It is important to mention that the Daisy-chain topology creates the potential for additional and unnecessary hops that could be omitted when using a centralized AVB Switch. This is where the Star topology becomes ideal for networks that require the use of more than just a handful of devices. A star topology utilizes the network’s bandwidth more efficiently. It also minimizes hops and the additional latency that can come with it. Star networks are based around a centrally located switch or switches. All the nodes on the network are connected to this switch, so there are fewer hops between devices.